Brenell Engineering Ltd as we know it was founded immediately after the war by two Czech refugees, Robert Hahn and Pavel 'Paul' Glaser, who both served with the RAF during the war; their handful of loyal staff were fellow countrymen. It is believed they bought, or bought into, an existing pre-war enginering business in the Caledonian Road, Islington, but that period of their history remains clouded. Never-the-less by 1947, Brenell was a busy, though small, precision jobbing engineers based in Northington Street, Clerkenwell, London making simple toys, 'optical toys' and metal screw caps for, it is believed, the photographic industry. They did patent a universal tripod head for photographers and by 1953 had been contracted to design and build a tape deck for a new home assembly tape-recorder, the "Sound Master". It is not yet clear how this Sound Master contract came about, but Brenell was under contract around this time on a telephone answering machine - of which little is known: it is perhaps ironic that the pioneer of tape-recording, the Danish telephone engineer Valdemar Poulsen, designed and patented his first machine to record telephone messages! 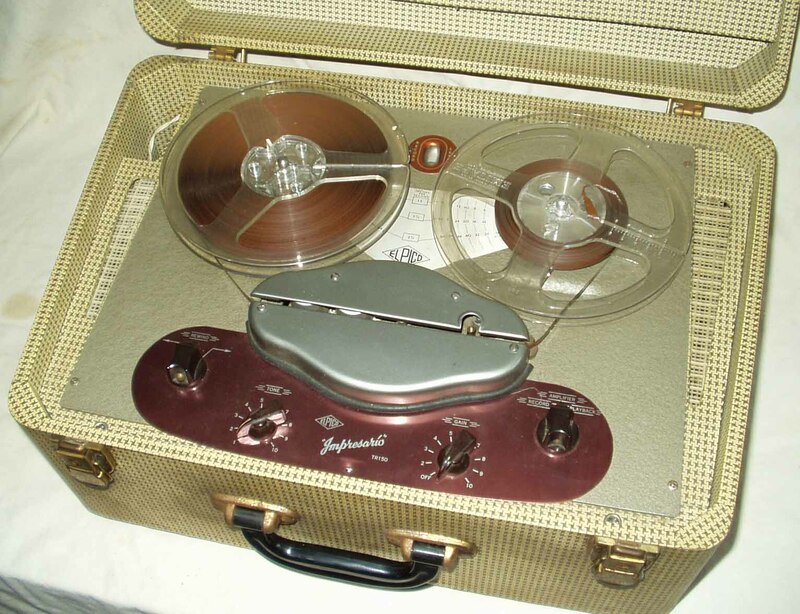 The "Sound Master" was designed as a simple, yet highly specified DIY 3-motor, 2-head, 3-speed, 8-1/4" tape deck using the best available technology and components to which could be added a valve pre-amplifier, either underslung from the deck or as a separate unit. All the budding audiophile had to do was invest 6/6d in a set of illustrated instruction sheets, source the recommended components individually and set aside a weekend to build this fine machine which, at £50, offered a substantial saving over the contemporary Ferrograph. The deck components could be bought direct from Brenell in kit form, or from selected radio shops, complete with Collaro motors and "Wearite" heads. Mechanical controls and linkages were incredibly simple, but of an entirely sound engineering standard. As these were the days of "Meccano" kits, anyone competent with a spanner, screwdriver and soldering iron was easily capable of assembling the "Sound Master"; indeed the illustrated instruction manual was so expertly written that it remains today one of the finest on tape-recording theory. It offered three speeds, with a top speed of 15ips for true hi-fi reproduction, set by a two speed pulley and a optional high speed capstan sleeve, giving the user the option of high quality recordings, or longer playing times. A simple printed time-lapse plate beneath the spools indicated available playing times. 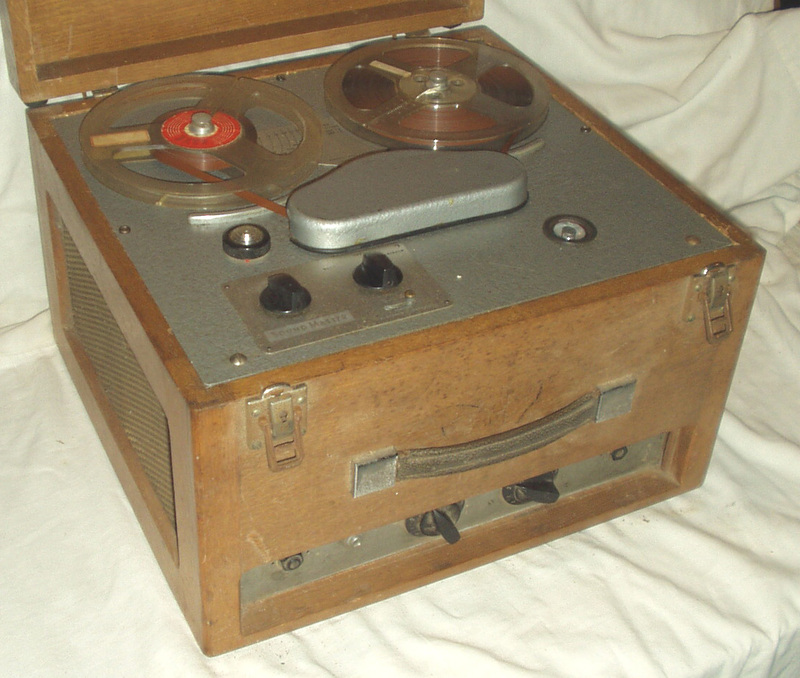 The deck was finished in a light grey metallic 'hammered enamel' paint and could be fitted into a standard ready-made case, or a radiogram; the photographs show the standard case and an oak-cased schools' example or unknown origin. 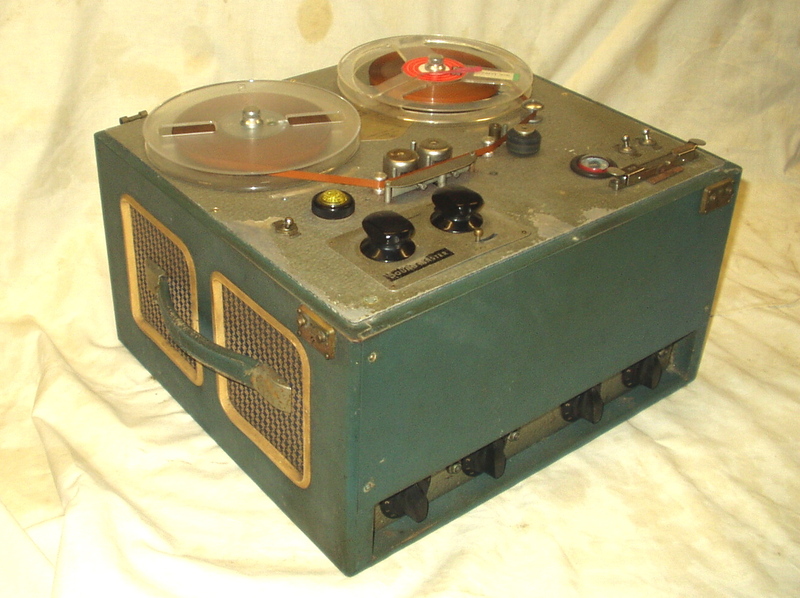 The "Sound Master" was very well received by contemporary radio engineering magazines, which encouraged their readers to modify, improve and experiment with tape-recording and create special effects. Even today, surviving machines still produce a high quality of recording and reproduction. Many hundreds were sold, prompting Brenell to design and build an improved 7" version for themselves under the 'Brenell' name. 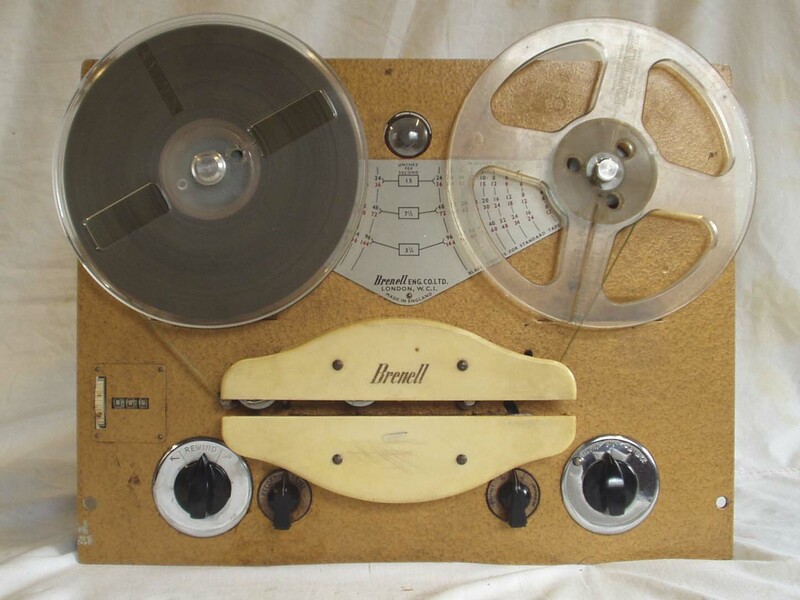 Launched in autumn 1955 as 'The Brenell', this re-engineered 7" version of the Sound Master was adopted by Elpico for their 'lmpresario' cabinet fitted table-top tape-recorder, with Elpico AC60 pre-amp, and the Elpico TR150 portable. Both carried the 'Elpico' badge on the tape counter plate, rather than 'Brenell'. The major differences were redesigned ventilation louvres, Marriott heads and the deck's function controls re-arranged either side of the new two piece enamelled aluminium, kidney shaped head covers. The speed selection remained unaltered but the upper head cover now had a cut-away to allow for the screw-on capstan sleeve to be easily fitted or removed. This produced a very high standard of reproduction through a simple Brenell-Marriott amplifier, offering a 4 watt output to the internal speaker; it had separate bass and treble controls. 'The Brenell' sold for 48 gns and was replaced by an improved Mk.II version in spring 1956, fitted into the same attractive crimson 'Rexine' covered cabinet but now with Brenell's own Mullard based Mk.II amplifier and Brenell's own heads, which they even supplied to Collaro. 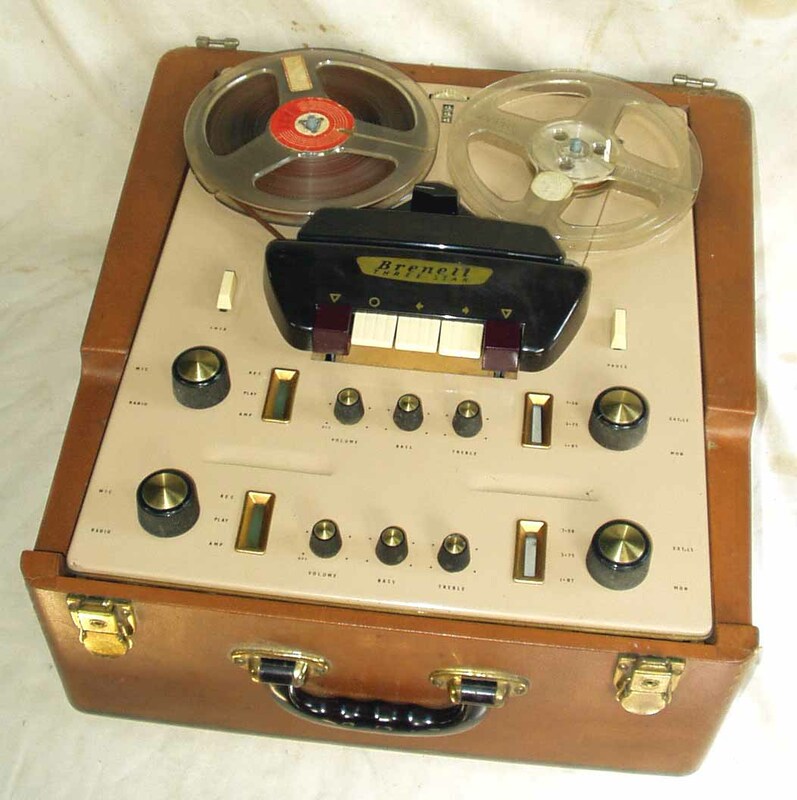 The pre-amplifier control panel was set at a slight angle to the deck; setting the style for future Brenell tape-recorders. 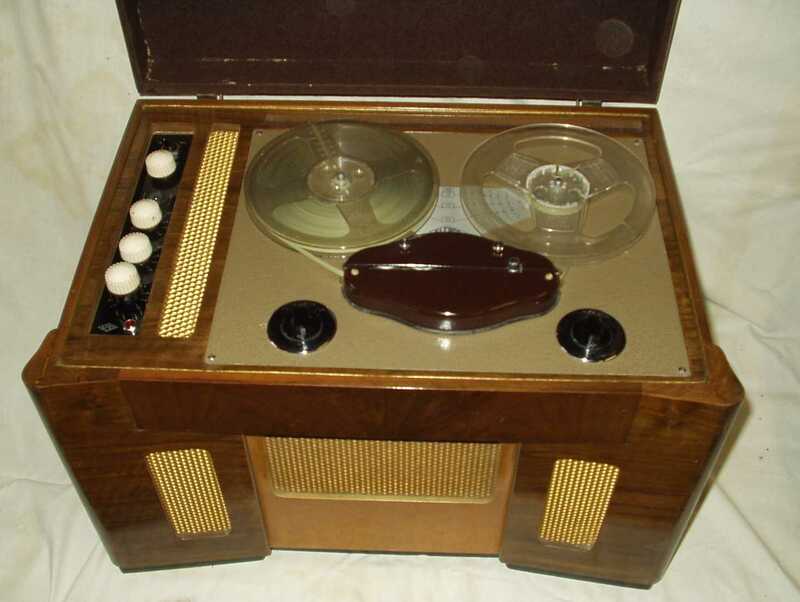 It was also available as a transport deck, to which the Brenell pre-amplifier and power supply could be added, making it a popular choice among radiogram manufacturers, both at home and abroad. In spring 1957, a much improved model, the 8-1/4" Brenell Mk.IV appeared together with an optional, much improved, alternative Pre-amplifier (see bottom of page) which incorporated a head de-magnetiser circuit and a new frequency equalisation compensation control for each of the three speeds which, unlike the Ferrograph, could be changed at will to compensate for different tapes and conditions. It appears that the 7" Mk.II may have continued to be marketed in America alongside the later Mk.IV as the Americans showed no interest in the 8-1/4" spool size. Can anyone throw further light on this anomaly? The new Brenell Mk.IV was developed from the 7" Mk.II but although it shared the same deck plate layout, it differed in many ways. The motors were now from British Thompson-Houston, set further back to accommodate the larger 8-1/4" spools. 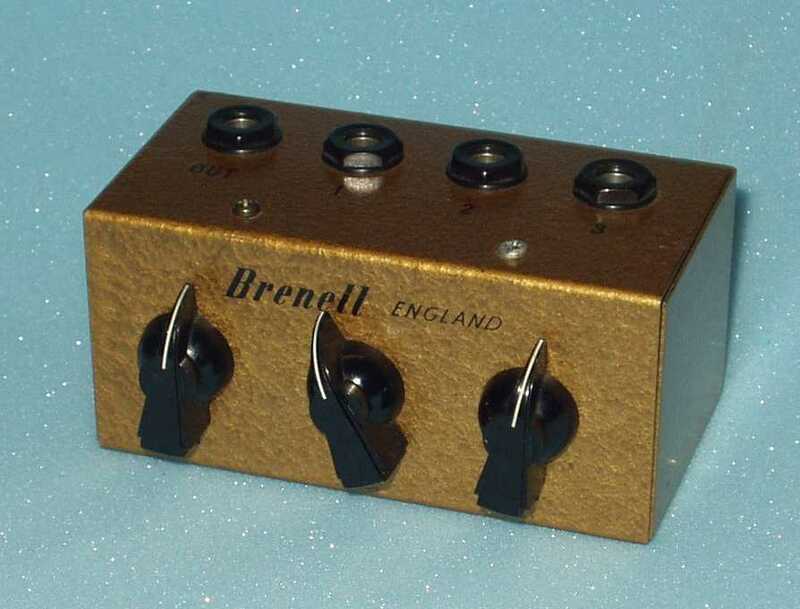 The heads were still of Brenell's own manufacture, screwed directly to the now 'gold' hammered enamel deck plate, but there was now provision for up to four heads allowing special applications, including "staggered stereo" - popular in America - indeed their 7" Mk.IV staggered stereo became the Mk.IVB. While the Mk.II required the drive belt between the drive motor and capstan flywheel to be raised or lowered for the two ratios manually, the Mk.IV had its speed changes by sleeves: a 1/2" sleeve for 7-1/2ips and a 1" for 15ips on high ratio. The unused sleeve was retained on a stud hidden by a new design of extended, kidney shaped, ivory coloured plastic head covers. 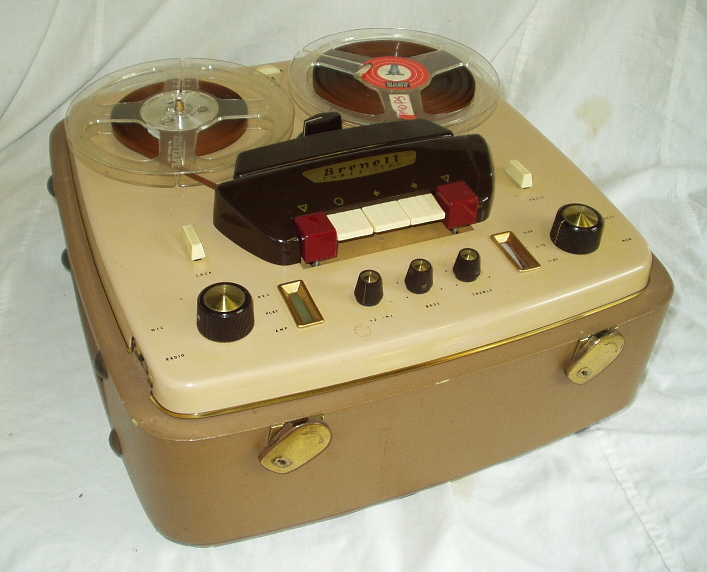 Whereas the Mk.II had the record function controlled by the pre-amplifier, the Mk.IV was fitted with a detente button on the new Record-Stop-Play motion control. It also had much improved control linkages, brakes and a new sprung tape back-tension control arm on the take-up side. The Mk.IV (later called the Mk.4) came in a splendid striped yellow/brown papered cabinet. It offered basic facilities but with a variety of options to suit the enthusiast, professional and industry. The standard lapsed-time plate could now be supplemented with an optional tape counter, fitted above the fast forward/reverse control, belt driven from the feed motor turntable. 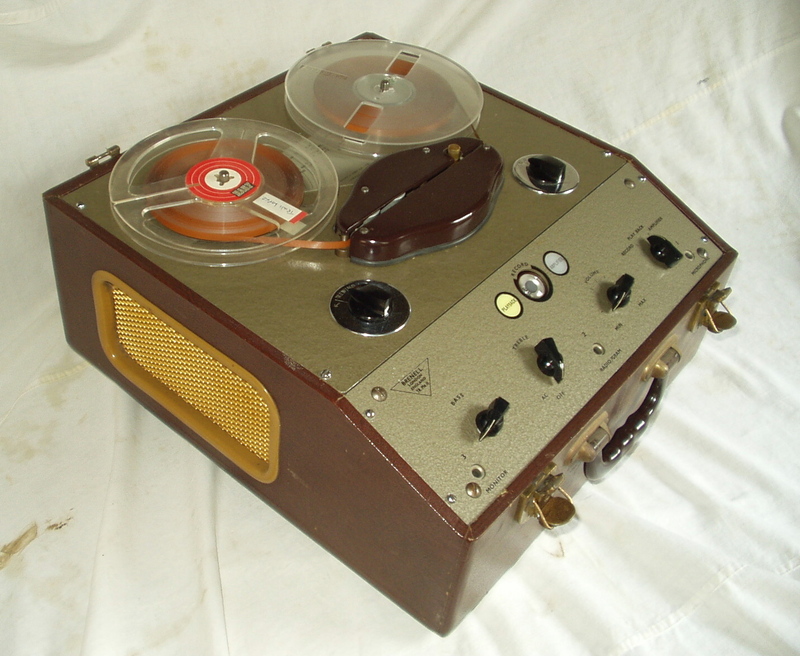 A special Mk.4 Model 600 was fitted with an underslung pre-amplifier for console mounting and a deck mounted 'Magic eye' recording level indicator. The gain control and optional frequency compensation correction control were fitted with miniature radio knobs (later with new black castellated plastic knobs) and were mounted on the deck below the head covers. The example shown was used by a Cambridge pathology laboratory. With its superior motors and heavier flywheel, the Mk.4 boasted an impressive 0.05% wow and flutter at 15ips, and a 50-16,000 Hz hi-fi performance. It sold well and soon established Brenell as a serious challenger to Ferrograph in the semi-professional field. Soon after launching the Mk.IV came an entirely new, purely domestic model, the 7" Brenell "3-Star", launched in spring 1958. Was this the Mk.III/Mk.3 by another name? This would be Brenell's only single motor design - but who designed it remains unknown. Idler drive from a new alloy bodied BT-H motor powered the heavy capstan flywheel while belts provided fast forward and rewind. Speed selection was by rotation of a cammed spindle set behind the large head cover, giving three speeds on demand: 1-7/8, 3-3/4 and 7-1/2ips. There was no need for capstan sleeves. To make it even more fool proof, it used piano key controls set centrally in the large, chocolate-brown head cover. It was also their first to use a deck-mask. Although a strictly domestic-user model, its 0.2% w&f at 7-1/2ips, frequency response up to 14,000 Hz and high quality internal speaker mounted to a substantial plywood cabinet, was more than adequate for hi-fi enthusiasts, added to which its ease of use made it ideal for schools. Its stunning design gained for Brenell a coveted Design Council Award. It was later fitted with the new Papst motor (these had the rotary cabinet catches seen in the photograph rather than the usual over-cam catch) and, with the popular move towards 1/4 track format, it was soon offered with 1/4 track 'Miniflux' heads for which a pair of push-button track selectors was added to the left. In 1959 a special 3-Star Stereo appeared: this was Brenell's first full stereo and cost 89gns, compared to 58gns for the mono. 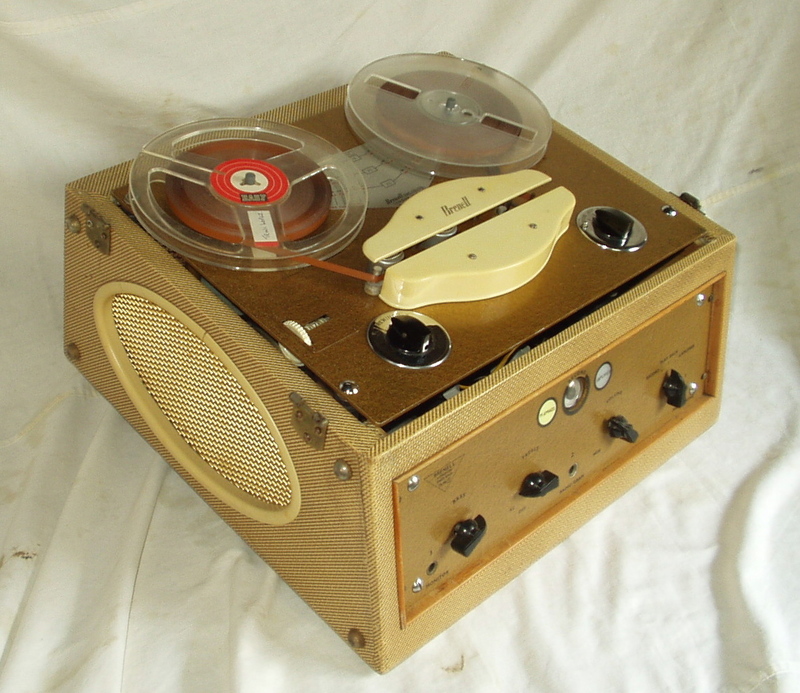 It used 'Miniflux' 1/2 track stacked stereo heads (as opposed to 'staggered' stereo) for which it was fitted with a second 3-Star amplifier but, unlike the mono, was devoid of a deck mask. This allowed both stereo recording and the playing of commercially produced, high quality stereo tapes from HMV and Columbia. Despite good performance, it was a short lived model and is today incredibly rare. In addition to the standard deck mounted pre-amplifier, with its 4 watt output stage to feed the internal 3ohm speaker (or external 15ohm speaker) on their Mk.II and Mk.IV recorders, Brenell also offered a Pre-amplifier for connection to other hi-fi equipment which incorporated a head demagnetising circuit, frequency equalisation correction and a useful signal output mute facility to avoid feedback during recording. It also used the new cathode ray recording level indicator, rather than the usual end-on EM34 Magic-eye. A revised version, called the TP.2, survived until the advent of their new STB based 'Tape Link' pre-amplifier. With tape-recording enthusiasts becoming more adventurous, companies such as Brenell, Vortexion and others began to offer simple mixers to combine, for example, two microphones and a record player to create sound effects for a stage play. Brenell's offering was a basic, 3-into-1 passive mixer which fed into the tape-recorder's microphone socket. Initially offered in gold hammered enamel, it remained available until 1970, now in blue-grey enamel. With its impressive model range, from the domestic 3-Star to the versatile Mk.4, plus a new Mk.5 on the drawing board, Brenell soon found themselves desperately seeking more space; this was met by additional works in a nearby mews at Doughty Street.